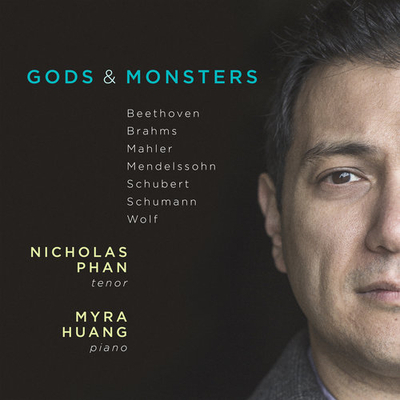 On March 5, our first haul was Gods & Monsters, an anthology of German art songs that tell stories, by composers from Schubert to Mahler. Of the 18 tracks, we played three: "Der Zwerg," (The Dwarf), Schubert's Gothic shocker of murder on the high seas; Hugo Wolf's stinging character sketch "Der Rattenfänger" (The Pied Piper); and "Aus Goethe's Faust," Beethoven's mock Lutheran treatment of the grotesque "The Song of the Flea," sung in Goethe's Faust by the devil Mephistopheles. In the spotlight, the versatile lyric tenor Nicholas Phan will not put you over the moon with the sheer sensuality of his instrument. Working in grayscale rather than than in the spectrum of the rainbow, he thinks nothing of throwing caution to the winds to make a dramatic point, at times at steep cost. I can't see arena concerts in his future, but connoisseurs of the art song will appreciate the intelligence, individuality, and commitment he puts in the service of the music. 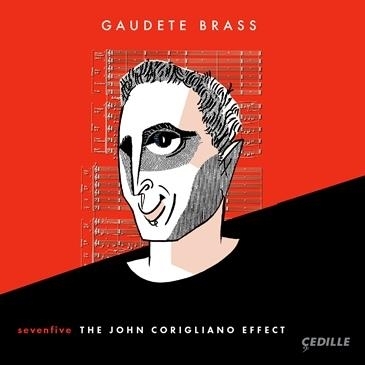 His latest album benefits hugely from the presence of the pianist Myra Huang, his frequent recital partner, who can conjure up a scene in a chord or merry hell in a trill. Next up: a pair of 20th-century violin concerti, buffed to a high gloss by Renaud Capuçon and the Bruckner Orchester Linz under Dennis Russell Davies, drill sergeant extraordinaire. 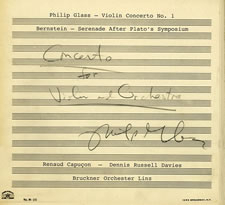 From Leonard Bernstein's Serenade after Plato's "Symposium," we excerpted the second-movement allegretto ("Aristophanes"), followed by the first movement of Philip Glass's Violin Concerto No. 1. Coupled on Glass's own OMM (Orange Mountain Music) under the title Glass/Bernstein Concertos, these are performances of magisterial assurance. No matter the idiom, Capuçon carves his phrases with Olympian calm, in burnished tones, nowhere more thrillingly than against Glass's paradoxical orchestral backdrops, which seem to whiz towards infinity at (nearly) the speed of light while hanging (nearly) motionless in space. Albert Einstein would understand perfectly. 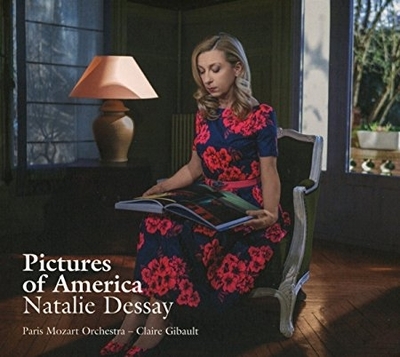 To close, we presented Sony Classical's new Pictures of America, an album of show tunes by a classical diva we challenged our audience to name. Our phone bank lit up not once as the lady piped her way through Tony's chugging "Something's Coming" from West Side Story, Stephen Sondheim's wistful "Send in the Clowns," and a gentle swing arrangements of Irving Berlin's "There's No Business Like Show Business," hitherto the property of belters like Ethel Merman and Judy Garland. And who was our mystery showstopper? None other than Natalie Dessay, the scintillating French coloratura renowned in bravura roles from the wind-up doll Olympia in Offenbach's Tales of Hoffmann to the wayward courtesan of Verdi's La Traviata. And her band? The Paris Mozart Orchestra, if you please, led by its founder Claire Gibault, who at the dawn of Dessay's operatic career twenty years back collaborated with her on, yes, Mozart. Crossover projects like this one are notoriously disaster-prone, but Pictures fizzes. Champagne cocktail? Ice-cream soda? Take your pick. Why the title? Because Dessay has matched each song to a painting by that American icon Edward Hopper. Bon courage if you want to dive down that rabbit hole. The press materials include a checklist of thumbnails, but no key; I, for one, can see no useful connection. Happily, the music will do just fine without the window dressing. Dessay's English is flawless, her timbre exquisite. At times her phrasing calls to mind Barbra Streisand at her most girlish and pristine. Circling back to the top of the show, I left Paul with a couple extra tracks of classic Schubert: Jessye Norman's hair-raising renditions of "Erlkönig" and—what else?—"Der Zwerg." For further comment on this subject, please click through to the companion post, "Bloody murder."